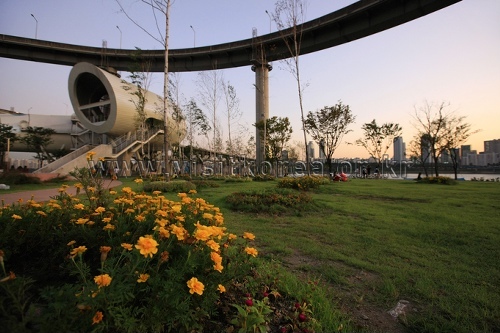 Also known as Ttukseom Recreation Area, Ttukseom Hangang Park is neatly structured on the riverside of the Han River. It is very popular as a picnic area. It also has its reputation as a place of variety of water sport activities-people can enjoy wind surfing, water ski, motor boat, etc. right in the center of Seoul. There are classes for beginners and the equipment rentals are available. Swimming pool is open during summer for a reasonable price. At the <Inchworm Hall> in shape of a larva, various exhibits are held and the Han River around the Ttukseom can be viewed.